Edit: Not sure why the previous edit didn't work, but the men's chess team actually played a tie with Poland. ... HHK calls for a 19:30 session to vote on the bill. ... BHK's Naira Zohrabyan and HHK's Arpine Hovhanissyan in a verbal argument with QP members. Things are pretty heated right now. ... HHK, BHK and ARF vote in favor of the bill. The bill is passed. ... QP ally Yelq's Edmon Maruqyan says this blitz voting has violated the protocols. The microphones weren't turned on, the voting process wasn't live-streamed as in all other sessions. 20:50: Thousands of protesters have already gathered an hour after Pashinyan made a live-stream calling for protests. The crowd is chanting "duxov" and "Nikol". 20:57 - Pashinyan with a megaphone on front of Parliament building. Says the HHK and their allied parties should be "dismantled" as a party. "HHK heracir", "HHK heracir". 21:00 - the Ministers are also present. They are doing the Viking clap. The crowd is chanting "artahert" (snap elections). 21:05 - HHK says this vote doesn't end the snap election negotiation process. They are still willing to talk. Pashinyan urges the crowd not to touch the MPs who exit the building. "Just smile to them and chant HHK Heracir". ... says there are 20,000 people right now in the area and moving towards the area. Two hours after the live-stream. ARF currently has 2 ministers and several provincial gubernatorial, after striking a deal with Pashinyan post-revolution. 21:40 - PM Pashinyan publicly fires all BHK and ARF members from the government cabinet positions. The crowd chants "shame" to BHK and Tsarukyan alliance. 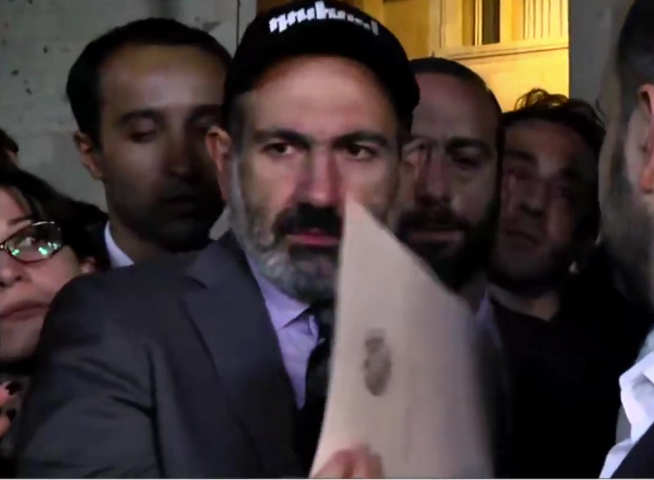 21:50 - Pashinyan officially signs the papers firing ARF and BHK employees from his cabinet. However, Deputy PM Mher Grogoryan has asked to stay and work with the PM, and has received a positive response from Pashinyan. 21:54 - Pashinyan says the president has 21 days to sign the bill or send it to the Constitutional Court. He calls for president Armen Sarkissian not to sign the bill and to sent it to the court, thus delaying its passage. After which, he says he will resign as Prime Minister. The Parliament will have 7 days to elect a new PM. If they fail to do so, they'll have another 7 days. If they do not elect one, there will be snap elections. 22:01 - Pashinyan will enter Parliament and negotiation now. Calls for the public to remain peaceful. Analysis: Here is Pashinyan's plan. Before the bill becomes law (at least 21 days if president delays the signing), Pashinyan will resign (possibly very very soon). Parliament will be given 14 days to vote for a new PM. If they fail, snap elections will take place. If HHK/BHK decide to hit him in the back by electing their on candidate as PM, Pashinyan will repeat the April revolution. 22:13 - Pashinyan and the crowd enter the Parliament area. He calls for the crowd to wait outside, but some from the crowd attempt to enter the building. The crowd has moved from the outter gates to the actual building doors now. 22:46 - if Pashinyan's plan works out, the snap elections could be even sooner than December. 23:04 - Pashinyan is currently in Parliament speaker Ara Babloyan's office, having a meeting with other party members. Vanadzor has joined the protests. 23:30 - it appears that BHK is not participating in the negotiations. Pashinyan is still in HHK Babloyan's office. 00:05 - The negotiations are wrapping up. Pashinyan is expected to exit the building soon. 01:01- The negotiations are over. Pashinyan is out to deliver a speech. Has to walk though the thick crowd to reach the stage. The crowd is chanting "HHK GTFO". 1:05 - Says all parties were present during the negotiations. He proposed his resignation if other parties sign a written pledge not to vote for anyone, triggering snap elections on December. The 3 parties have acknowledged the situation, but only gave a verbal promise not to vote for anyone after his resignation. They've discussed the reasons for the snap elections. Pashinyan insisted that the current Parliament doesn't represent the people's will. He gave examples why the elections can't be on May, 2019: There is a political crisis in the country, the situation makes the field more uncertain for investors and for the public. Says it can't be sooner than December. 1:28 - Says he has spoken with president Sarkissian (about delaying the bill), who said he won't do anything against the public. More on that when he returns to Armenia from NYC. 1:30 - says he will resign regardless whether there will be a written pledge by parties or not. After resigning, he will continue as the acting PM until a new one is elected. During that time, he will replace today's fired governors and ministers. 1:33 - Says he is happy with today's results. Asks people again not to use slurs against politicians. Thanks the NSS employees for providing today's security, the army (long claps). The crowd is paying tribute to Aznavor with claps. Viking clap time (modified Armenian style dhol). The speech is over. They'll walk few minutes on the streets before going home. Thank you for tuning in. That is all for now. This page was last edited on 17 March 2019, at 04:48.